Bluegrass is not a genre that I get to spend a whole lot of time on in these virtual pages. 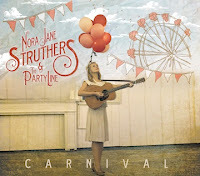 So as a breath of fresh air, I was pleased to hear Carnival the sophomore album from Nashville's Nora Jane Struthers & the Party Line (out April 16th). When you throw the record on you better strap yourself in for a banjo and fiddle throwdown. The whirlwind "Barn Dance", "The Baker's Boy", and the raucous "Party Line" are among the numbers that will have your toes tapping. 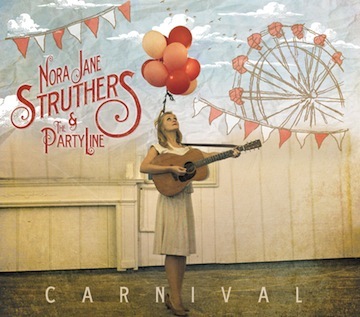 The title track is an ode to the midway and its sideshow freaks. Try listening to it back-to-back with Nick Cave's "The Carny" for some juxtaposition. Struthers has a strong and versatile singing voice, however, it's the energy that Struthers brings to the table that makes a song successful. The songs are far less engaging when the pace slows. Tracks like "Mountain Child", "Two Women", and the more traditional country ballad "Listen With Your Heart" don't have the same depth of sound as their more up tempo kin. The album's standout is the closer "Travelin' On". It's melodic with strong vocal harmonies, but more importantly it has outstanding claps and campfire-style percussion that lends an incredibly intimate feel to the song. Carnival is a strong album whatever the genre. I think it will earn a place in my rotation on the strength of it being a significant change of pace for me. Best tracks: "Barn Dance", "Travelin' On"